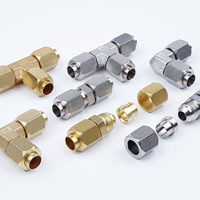 DK-LOK® JIC Flare fittings meet the strict requirements of SAE J514 industry standards for 37° flare fittings. The simple design incorporates a flared tube end, body adapter, sleeve and nut capable of sealing fluid media under high pressure. The 37° JIC fitting design results in a compact design requiring low assembly torque with high pressure capability. Standard materials are brass, plated carbon steel and S316 stainless steel.